Prof. Ying-yi Hong, Co-Convenor of the Global China Research Programme, moderated the 6th Global China Research Programme Working Seminar. Prof. Kam-fai Wong is the Director of the Centre for Innovation and Technology. He is also the Associate Dean (External Affairs) of the Faculty of Engineering of the Chinese University of Hong Kong. Prof. Wong’s research interests cover Chinese information processing, databases and information retrieval. Prof. Wong has published over 250 items, including 10 books, 84 journal articles, 153 conference papers and 9 book chapters. 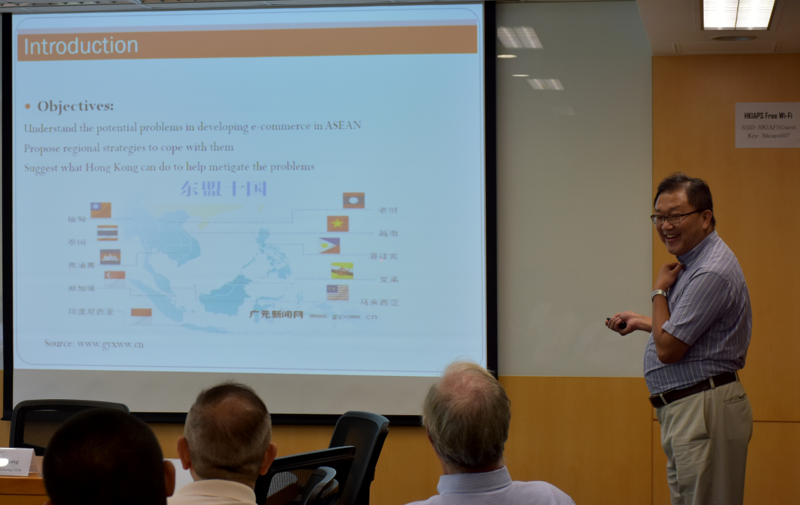 In his presentation, Prof. Wong demonstrated the readiness of the ten ASEAN countries to engage in e-commerce. An E-commerce Readiness Index, consisting of three sub-indexes or factors, was established for evaluation and comparison. As a result, the ten countries can be roughly classified into three categories. While Malaysia and Singapore are the two e-commerce ready countries, Malaysia still has room to improve its online payments and language facilitation. Indonesia, the Philippines, Thailand, and Vietnam are countries in the middle rank. The Seminar also shed light on how Hong Kong could play a role in removing road blocks to e-commerce and in facilitating cross-border e-commerce for countries along the BRI. Twenty-two scholars, researchers, and students attended the seminar. Prof. Wong had a fruitful interaction with the participants.